For IMAP accounts you can configure multiple folders to skip. NOTE: The POP3 protocol only allows the download of the INBOX, so you must use an IMAP account to use this feature Skipping * will be ignored as the account would not download any email. You can optionally skip the GMAIL special folders that duplicate email from other folders. These are the folders stored under the IMAP path [Gmail] and are used to represent label information and other attributes. If you choose to download these folders as well from a Gmail accouint you may end up with duplicate email. When a large email is ecountered it can be downloaded, postponed until all other email for the account have been downloaded or skipped altogether (and left on the server). The first time this account connects it can be made to download and forward all existing email or just ones that arrive after the first connection is made. Accounts store a list of unique IDs for email already seen. The ID cache is used to work out what new email to download. WARNING: If you are keeping or expiring email on the POP3 server then clearing the cached ID list can result in duplicate email being downloaded and delivered to your server. An exception to this behaviour is Microsoft Exchange, which implicitly deduplicates by the MIME Message ID, so even if you redownload email and redeliver to Microsoft Exchange they may not appear in your Exchange mailbox. Exchange does not log this behaviour, or document for how long it caches Message IDs. Retain previous ID cache if no new IDs are found. The ID cache will be retained until a new list can be downloaded from the server. To prevent duplicate email being downloaded if the server changes its unique ID for email, Hexamail stores the Message-ID of all downloaded email. 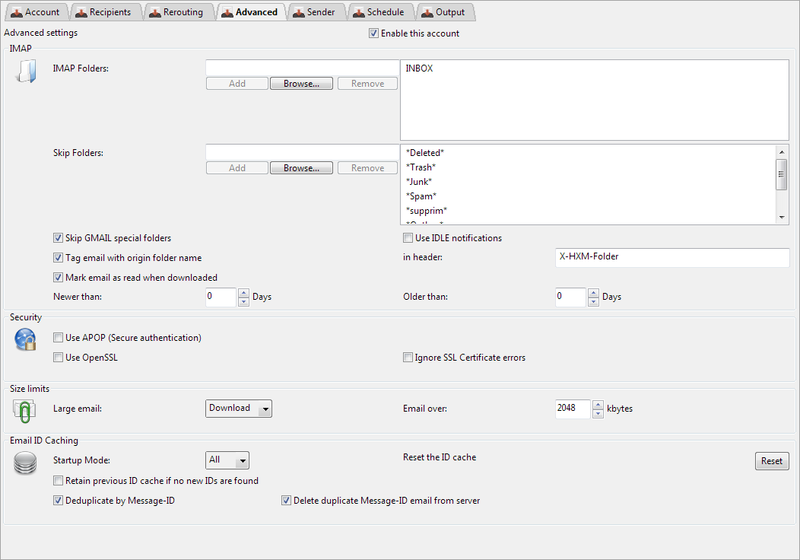 Use this setting to instruct Hexamail to deduplicate email by Message-ID headers. To prevent duplicate email being downloaded if the server changes its unique ID for email, Hexamail stores the Message-ID of all downloaded email. By default Hexamail will never delete an email that has not been downloaded and sent to the next server. Use this option to remove email with duplicate Message-IDs from the server even when Hexamail skips downloading the duplicate messages.